In a Vase on Monday: Ding Dong! The Easter Bells are ringing! 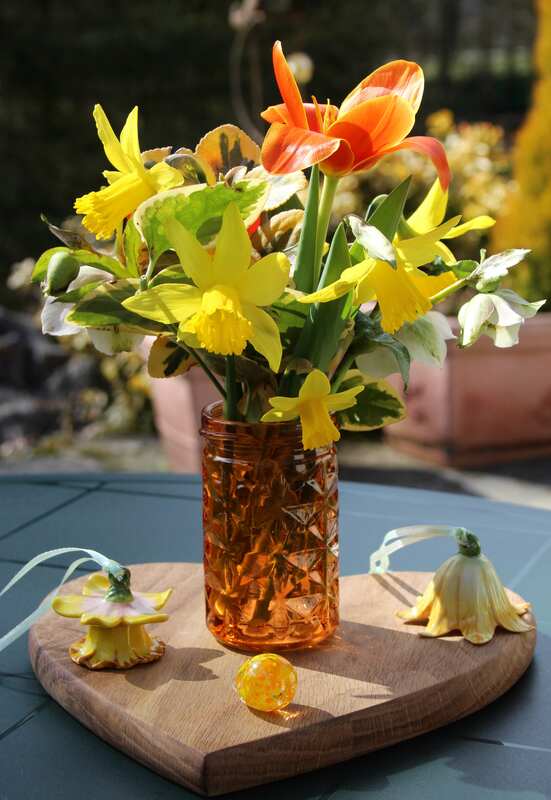 Yes, the German name for daffodils is Easter Bells (Osterglocken) and they are perfectly timed for Easter this year too. I know many people have been enjoying daffs for some months now, but mine are just getting going with such a cool spring. So here is my vase for Cathy’s meme this week. The porcelain bells are meant for hanging on an Easter branch – many Germans hang painted eggs or other decorations on hazel branches or twigs as an indoor decoration. And the well on the town square is also decorated with greenery, but sadly they use gaudy plastic eggs so I will spare you a photo of it! The tulip ‘Early Harvest’ is at its best now. The stalks have grown a bit longer and the flowers will keep going for ages unless we have a heatwave… at least that is one advantage of a cool spring! I added a few sprigs of golden Euonymus and Vinca, and a couple of white hellbores. I wonder what colours are dominant in your garden right now – do you have spring yellows and oranges too? Go and visit our host, Cathy at Rambling in the Garden, and see what she and everyone else has put in a vase this Monday. ← Hey, I thought spring was here! That’s a lovely vase Cathy, I like the idea of decorating a branch for Easter, I remember being in Prague one spring and the square was filled with Birch trees in huge tubs all beautifully decorated with eggs. You’re right about the spring flowers lasting better in the cooler temperatures; My tulips have never lasted so long before. The crocus have only just gone over in the last week so they lasted much longer than usual, and now the Scillas and Hyacinths will start to fill the gaps. I would like some warmth though – very chilly here still at just about 8°C with a cold wind. It was really cold here last night. A friend was inaugurating a new gelato shop and all we really wanted was some hot chocolate! 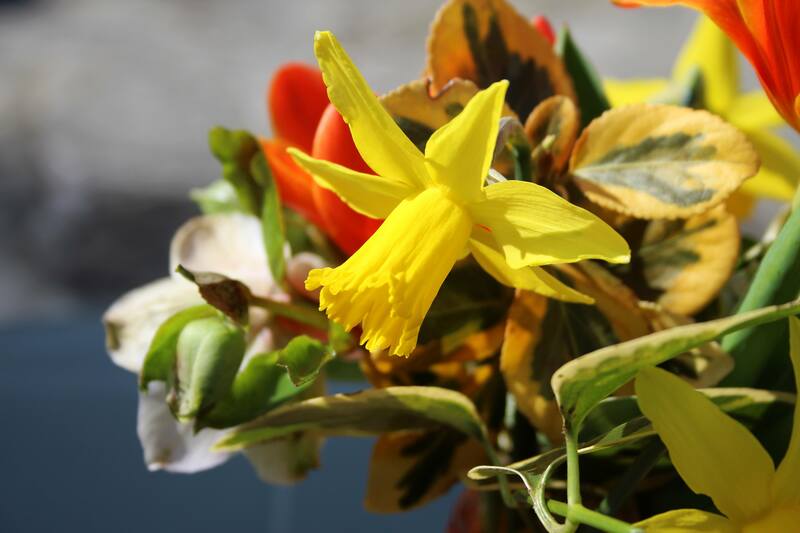 I love your Easter bells, Cathy….mine are not blooming as it is still too cold for them. I love your flowers in that jar… perfect, along with the lovely display of porcelain bells in the shape of flowers. Hope your weather also warms up over Easter Donna! A beautiful arrangement of warm coloured blooms here, Cathy. Our garden is all blues, purples and yellows at the moment. that sounds lovely – those colours are especially pretty in spring against the bare earth. Such a delightful vase Cathy! The early days of spring are so exciting, filled with such anticipation. Even though it may rain this afternoon, it feels like spring. The afternoons have been warm and the garden welcomes both the sunshine and another drink. We still have cold winds which take any heat out of the little sunshine we are having… maybe it will finally warm up next week! That is why I love this early tulip – a big splash of colour early on brings the garden to life, and they look lovely with the daffodils! Such a pretty arrangement. Colours in my garden – the green of the newly emergent shoots, red of the new bronze fennel plumes, the palest yellow primroses and a hint of blue from a few scillas. Still too early this far north, but perhaps next month…..
My scillas are also only just flowering too. Lovely to see some blue in the garden. I read your title Cathy and immediately thought of a carry on film and a line about a matron. However, your vase is beautiful and full of spring cheer, like you we are waiting for warm sunshine, hope it comes soon for us all. I don’t remember that Carry On scene Julie! I’ve been trying to think of some of the famous actors’ names since reading your comment and had to resort to googling… 😉 Hope you have a sunny Easter weekend! 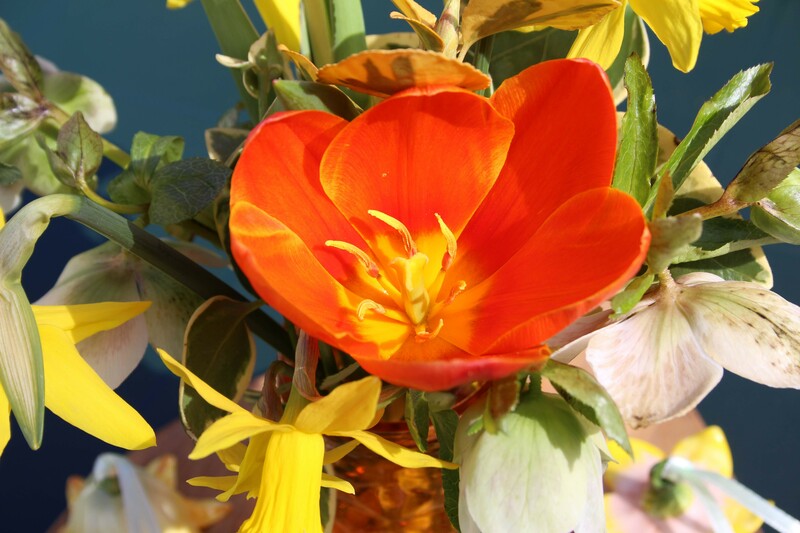 I love these early tulips Cathy – a bit flashy, but they go so well with the daffs! 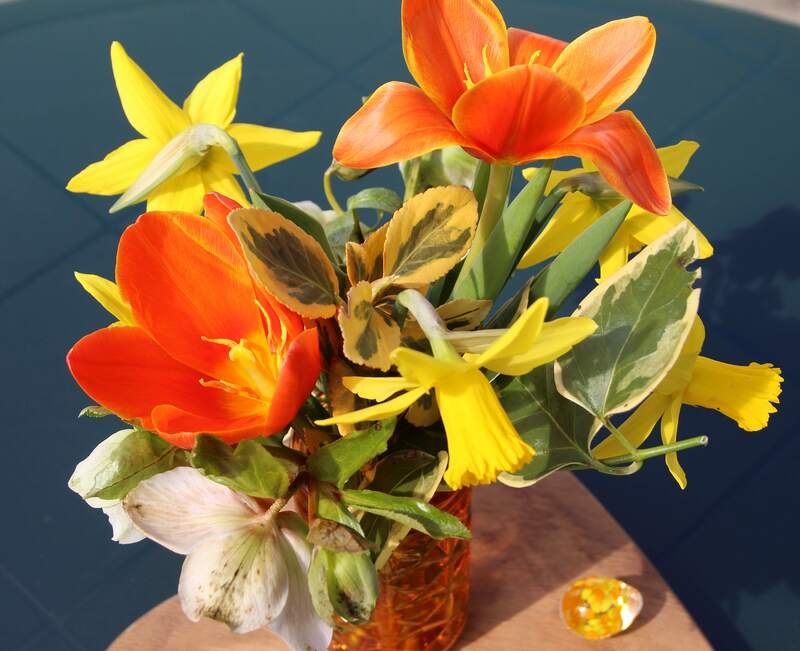 I love the warm orange of the tulip, which complements the bright yellow of the daffodils beautifully. I hope Easter brings you warmer days, Cathy! Thank you Kris. Have a lovely Easter! The porcelain bells are a lovely idea, I don’t think I have seen any over here. I shall have to import some! Lovely Easter colours Cathy. They are by Villeroy and Boch, and there is a whole series of spring flowers available. Have a nice Easter Brian! Easter Bells! What a lovely thought…with the visuals to back it up. When the Easter bells are over we will have the Glockenblumen (Campanula) Blauglöckchen (Hyacinths) and the Pasque flowers which are called cow bells here! 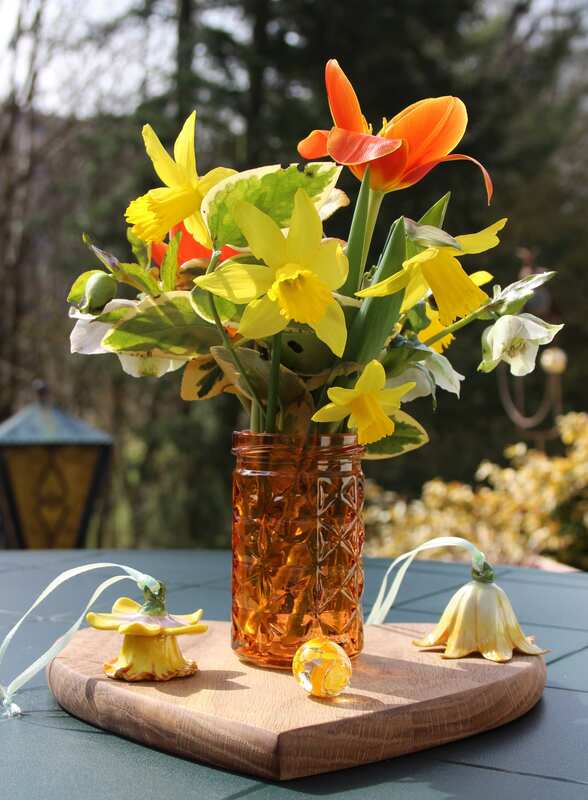 A lovely arrangement for Easter. The ‘Early Harvest’ is a beautiful color. Have a nice week Cathy. Thanks Susie. Have a lovely Easter weekend! What wonderful colours and a lovely vase. I didn’t know the german for daffodils, so that was interesting. Your porcelain bells are delightful. I love some of the common names for plants here – as in the English language they often conjure up lovely images, like Easter bells! I love the vibrant and happy colors! It’s been in the 40s F, which is perfect for working outside, getting pruning done. Rain today, but I’m itching to get at the beds before things start growing. The window is so small! Your ‘Early Harvest’ is ahead of mine – I just got the first two blooms! They are a bit brash, but aren’t they welcome with that lovely rich colour so early in the season! Mine are getting taller by the day too. What a beautiful arrangement of flowers, colours in spring are wonderful. I agree. I think we need colour more at this time of year! Love the combination with reds and golds. So interesting to read about the Easter Egg trees on branches, my mother used to do exactly the same thing. I can remember picking the branches, blowing out the eggs and dying them to make the tree. Happy Easter! Happy Easter to you too. I haven’t got a branch this year as I am happy to have some vases of flowers instead! Love the name Easter Bells. Your vase says Spring to me! Yes, the birds think so too and are very noisy… just need a bit of warmth now! Lovely vase full, with the aptly named Early Harvest stealing the show. Lovely post, Cathy. That amber glass jar/vase was a surprise. It lends itself beautifully to the warm oranges and yellows of your arrangement and what a stand-out against your blue, albeit cold sky. My garden is currently dominated by purples and yellows. Everything is lush and green thanks to our recent rains. Lush and green does sound good Alys! Hope your rain catchers are filling up nicely! Cathy, they are full! I’m so excited. Did you mention that you also have rain barrels? Do you have to empty them during the winter due to the freeze? We don’t have rain barrels… yet. But they would have to be emptied in winter. At some stage in the future we want a rainwater system. I do have an old concrete basin that used to have a pump in it for a water feature (several decades before we came here!) and we use that when it fills up! You’ve taught me something new…something I shall remember: Easter bells. Your arrangement is delightful. Happy Ding donging. I’ve just picked some Osterglocken from my garden today to go with out home-marbled eggs (polystyrene) and the willow branches. They’ll be sprouting green shoots very soon… just not in time for Easter. Absolutely lovely, and so representative of the season!